The year is coming to an end and I've been looking at all the challenges for 2010 that have been coming up. I swore I wasn't going to do any challenges that didn't last the whole year, but one caught my eye that I just have to do: Shelf Discovery Challenge hosted by Julie of Booking Mama. It is her first challenge ever, so congrats to Julie for thinking of it. 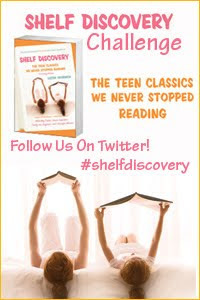 The challenge is based off of the book "Shelf Discovery: The Teen Classics we Never Stopped Reading. I was browsing the book on Amazon and really liked the author Lizzie Skurnick's sense of humor. There are lots of interesting books I read when I was younger and surprisingly quite a few I didn't. I decided to join in on the challenge. The goal is to read 6 books mentioned in Shelf Discovery. It looks like I'm going to go on a Lois Duncan kick. And a bonus book: The Endless Steppe: Growing up in Siberia by Esther Hauzig. Thanks so much for joining us! I haven't read any of your list except THE WESTING GAME! I'm in this one too. Oh, yeah! Another one! This is a great challenge. Here are my choices.